Putnam City teachers Nikki Craig (left) and Lisa Myers (right) visited the state capitol on Mar. 26, 2019 to lobby for increased education funding. Lawmakers appropriated about $50 million more to education last year— a fraction of the $200 million demanded by the Oklahoma Education Association, the state’s largest teacher union. That’s why teachers have returned to the capitol this year. Putnam City teacher Nikki Craig was at the capitol nearly every day during last year’s walkout. She recently returned to talk to lawmakers about outstanding needs in classrooms. Craig told Democratic Sen. Julia Kirt she relies on two teaching assistants to manage her class of thirteen, but the position has high turnover due to low pay. Craig teaches the most severely disabled students at Will Rogers Elementary School. They range in age from five to twelve. Some are in wheelchairs. Others use feeding tubes. And most need to be changed multiple times a day. 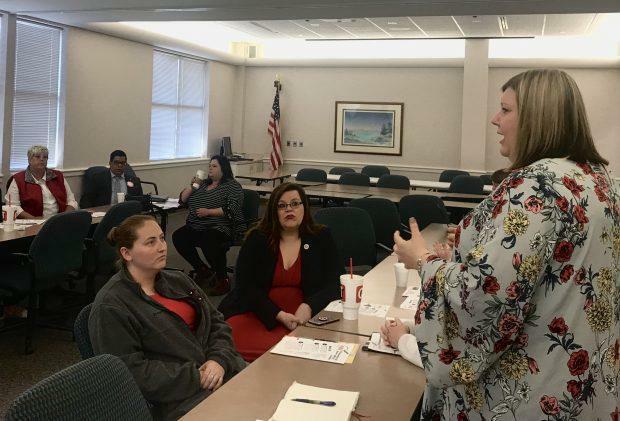 Over thirty educators gathered at the Oklahoma Education Association on March 26, 2019 before heading to the state capitol to lobby their representatives. Craig is one of many teachers from across the state continuing to visit the capitol. OEA President Alicia Priest estimates forty to fifty union members have lobbied their representatives each week since the 2019 legislative session began, in hopes of swaying lawmakers to add more money to the school funding formula this year. Dozens of educators filed to run for office in 2018. Just seventeen were elected, though education was a common campaign theme. “Everybody wanted to talk about how education was the number one priority for our state,” remarked Democratic Sen. Carri Hicks, one of the former educators who took office this year. But these educators-turned-lawmakers face the same underlying reality as last year’s legislature: revenue that falls short of agency budget requests. Legislators are mulling a second teacher pay raise, in addition to the one passed just before last year’s walkout began, but there has been little discussion of boosting funding for things like supplies, support staff and teacher training. Hicks supports another teacher pay raise and more classroom dollars, but she worries it’s become and either or scenario. Newly elected Republican Rep. Danny Sterling feels differently. Sterling recently retired after forty years at Tecumseh High School. When it comes to making budget decisions, he is looking to leaders in the House of Representatives for guidance. Thanks to continued economic growth and last year’s tax increases, the legislature has more than half a billion extra dollars to spend this year, but the education department’s request alone would eat up close to 75 percent of the surplus. “It is our constitutional responsibility to express the needs of schools in meeting the needs of kids,” said Superintendent Joy Hofmeister. On top of rising costs, Oklahoma’s student population has grown by over 50,000 since 2008, and Hofmeister says the needs of Oklahoma’s students have changed dramatically due to widespread poverty, incarceration and addiction. Craig can attest to that, and it’s one of the reasons she believes schools need more money. She said she often gets pulled away from her students to address behavioral problems in other classrooms. “We have more training in de-escalation techniques, and a lot of times the regular teachers don’t know how to do that,” Craig said. However, education isn’t the only thing legislators have to fund this year. Other agencies have also asked for more money, and the state has existing obligations, like debt. Republican leaders are also interested in increasing state savings, something Gov. Stitt has advocated for as a way to avoid deep spending cuts during the next economic downturn. Hicks says this is not the time to put money away. “Time is precious and the lives of our children, and so I just have a really hard time saving for our future at the cost of now,” Hicks said. Oklahoma law requires the legislature fund education by April 1st, but the House and Senate have yet to reach any agreement. The Oklahoma Education Association says they haven’t ruled out another teacher walkout.